We staged the awards banquet of The 7th annual International Business Awards at the Ritz-Carlton Hotel in Istanbul, Turkey on Monday, September 27. What a weekend, what an event. The hotel is lovely, and is about two stone-throws from the Bosporus. Istanbul is a vibrant, busy, fascinating city. I had heard that Turkish food is good, but it was great and memorable! The awards banquet was attended by more than 260 executives from 24 nations, making it the largest IBA awards banquet to date, surpassing Dublin, Ireland in 2008. 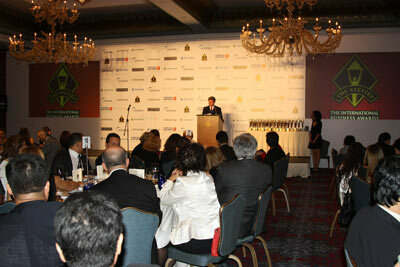 Thanks to the Turkish companies who participated in the IBAs this year for their strong support. You'll find photos and video clips of the event here. It's easy to forget that even the most powerful business executives are just men and women who want to be recognized for their achievements like everyone else does. Whether you're winning marketing awards, sales awards, public relations awards, or what have you, it's a moving experience to receive a substantial trophy, a round of applause, and a moment in the spotlight. 1. The Turks are on the verge of rivalling the Koreans for IBA dominance. Turkish companies took home the most awards this year, but the event was on their home turf. Nevertheless, I look for them to be a leader among IBA winners for years to come. 2. Korean companies are successful in the IBAs because they enter as a bloc. They smartly concentrate their entries on a handful of categories, and dominate those. More countries should follow their example. 3. The British give the best acceptance speeches. Always engaging, always literate. 4. Best acceptance speech of the night had to be Maxim Behar's, of M3 Communications in Bulgaria. But maybe I'm biased because he wore a tuxedo? 5. Best IBA meal ever. Caviar, fine wine, fabulous olives.